Steinberg/Jones, a company well known for their MIDI software, has just announced a new product that may be the next step into the future for the computer/music combination. 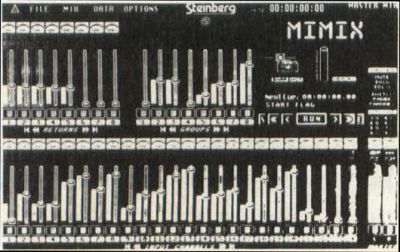 MIMIX is a multichannel software-based mixing console that offers a screen display including 42 VCA levels, 34 VU meters and 180 various switches, all of which may be manipulated with the mouse. Audio signals are displayed using a needle meter with an LED peak indicator or using a bar graph with a peak hold meter. Each channel on the mixer features a real-time VU meter; mute, solo and solo defeat switch; read/write update mode; VCA level; and a 24-character name. The hardware portion of the system is the MIMIX VCA Module, which is contained in a 19-inch rack-mountable unit and includes a real-time noise gate with ten programmable parameters. The MIMIX system can handle eight of the VCA Modules. The MIMIX system contains too many features to list here; anyone interested should contact Steinberg/Jones. But you'd better look at the prices first: $5,995 for the 16-channel system and a whopping $19,995 for the full 64-channel system.